Hello there. Just signed up today and was interested in getting into the open track scene. I'm currently in the process of remodeling my garage to fit the car I'm buying. 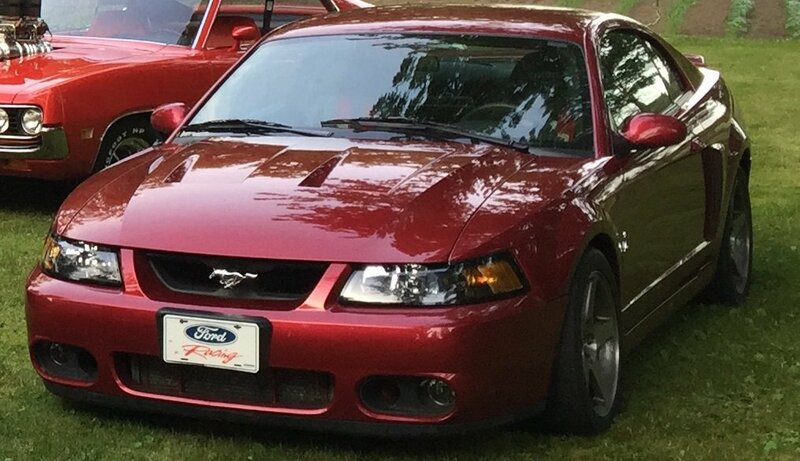 The car is a 2003 Cobra that my uncle owns. The car is a heavily modified road course track only type car. 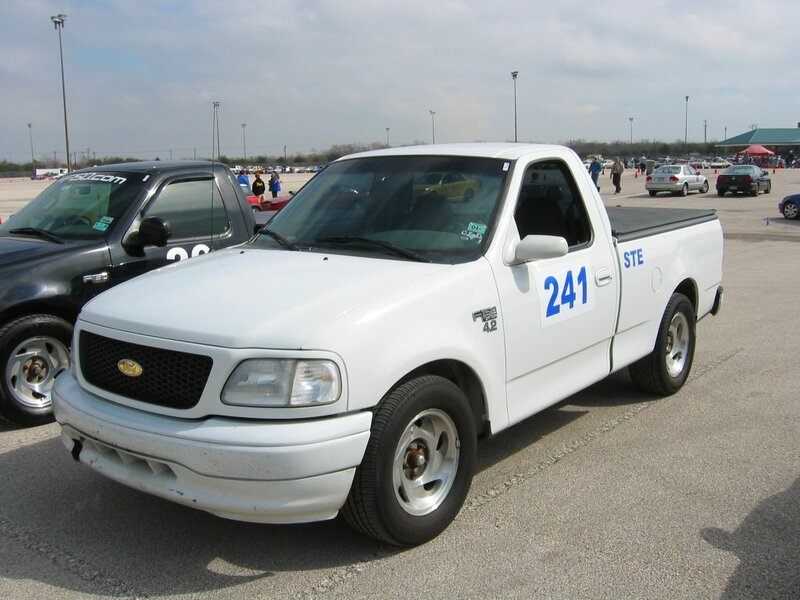 It has around 12k miles and around 10k of those have been on a race course. In fact the car was only registered once at the time of purchase in late 02. Once that registration expired he has never renewed it. Instead he trailed it to/from his home in Indiana to places like road america, watkins glen, indianapolis, gingerman are the ones I remember him telling me. He's retiring so he doesn't really have any more desire to track the car and I'm wanting to get into the scene. Here are some photos of the car and and a mod list. Welcome to Track Junkies! You've got quite an awesome car on your hands. I like to think TJ's are car enthusiasts, not car snobs. I for one love almost all interesting cars, and the Terminator is no exception. 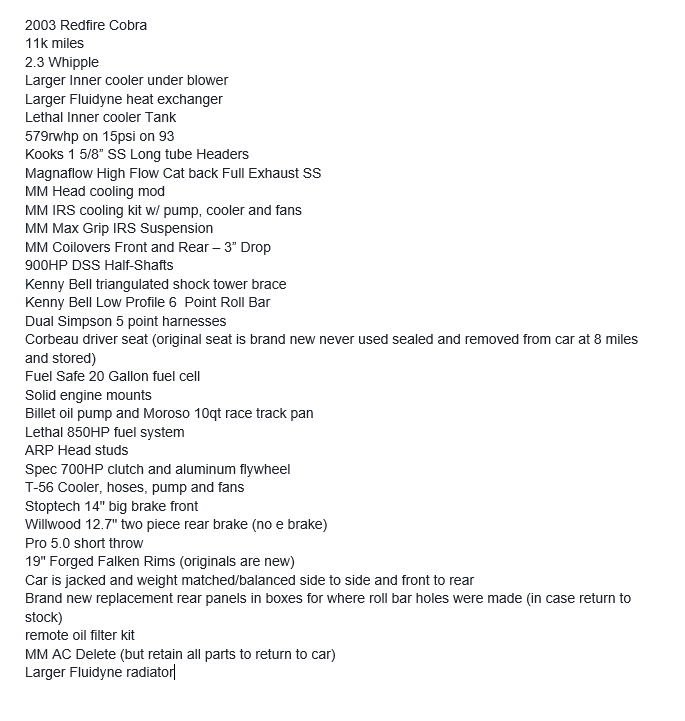 Looks like the mods list is pretty thoughtful, should make for a safe and fun track car, though a LOT of car to handle. If you're in Texas, I hope to see you and the car out at the track sometime. I'm Houston based. I need to get some instruction time in before I really open up. Yes the car will be a beast to handle. This is something I'll slowly get into. Everything on the car was built for turning, braking and keeping the IAT and fluids cool. I'm fortunate to of been able to pick the car up. It's in Indiana right now and I need to finish my garage remodel before I get it transported to my home. 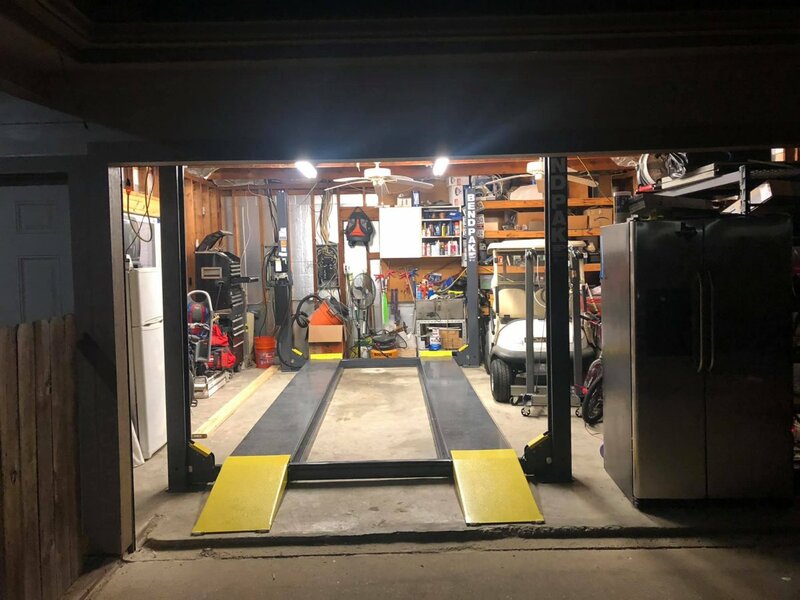 I've recently installed a lift in my garage and a roll up overhead residential style door so I can get the car up high away from the kids. I now have to reframe the ceiling to 12' in height and insulate/wall in the entire garage and paint to finish. I need this done before I move the car down. The car deserves this lol. But boy do I have much more to do. Lots of cleanout. Terminator setup nicely is a great track car! Are the seats the same Drivers side and Passenger side? 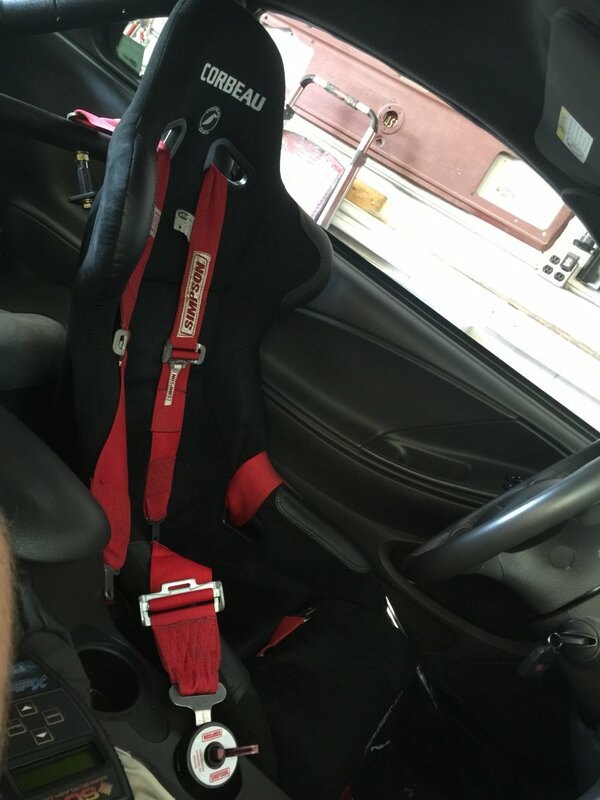 Most groups require the same type of seats and safety equipment for instructors and drivers, so if you've got a seat with a harness on the driver's side you'll need the same on the passenger side (they don't have to be the same brand or anything, just the same type/level, so if the driver has a 6pt harness the passenger needs one too). That's what I was getting at - looking at the car pic through the windshield you can kinda see harnesses on the passenger side, but no mention of seat type. Just the driver seat is the Corbeau while passenger is stock. Both Simpson 5 points though. He tracked the car in the northern parts (Wisconsin/Illinois/Indiana/Pennsylvania) so I'm not sure how he got away with it. Well... I think he got through all of the training stuff and when he solo'd he changed it out perhaps. Not sure. My plan was to buy a matching passenger seat so I can preserve the seats. I do want to keep the car nice but still drive the piss out of it. Interior is what is most important to keep nice, exterior can be painted and such. I want the ability to return to stock outside of the subframes if need be later. It's a low mile car and there is a possibility of me building a dedicated track car that dubs as a mile car that I'll need to do some extensive aero on. Not sure which seat that is but to me looks like the FX1 Pro. Pretty cheap and the harness is there. Probably just a seat bracket is all and I'll be up to par. No AC on the car and I think the radiator prevents this from going back in so I may have to suffer for the street use. My truck back in the day was no AC also. Surprising I had the race weight on the F150 down to 3525lbs. Held it's own lol.